In this companion to the acclaimed Z Is for Moose, Moose infiltrates a book about shapes (because he loves shapes, naturally) and it is up to his best friend, Zebra, to restore order and save the day. Another triumph from the award-winning team of Kelly Bingham and Paul O. Zelinsky. 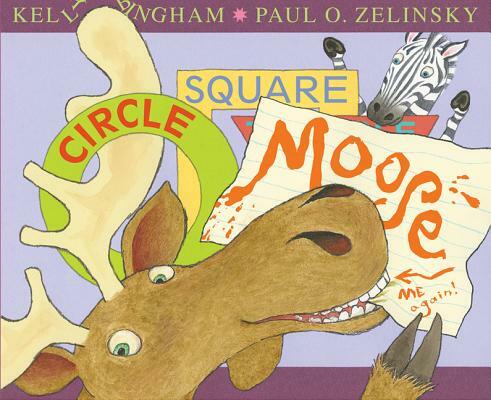 This hilarious book manages to illustrate a fact or two about shapes while providing a three-dimensional stomping ground for best friends Moose and Zebra. What will happen? Who will save the day? It's all up in the air until the final page, where Moose and Zebra (and Cat, too) create a perfect—and perfectly heartwarming—ending. This stand-alone companion to Z Is for Moose features a multilayered story told through text, asides, conversation bubbles, and pictures. Themes of friendship, exploration, and conflict resolution—and of course the concept of shapes, including the shape of a book—make this an ideal read-aloud for the elementary school classroom and for home! Kelly Bingham has been a storyboard artist, story supervisor, and director and is now a writer. Shark Girl, her first novel, was named a Best Book for Young Adults by the American Library Association. Its sequel is Formerly Shark Girl. Kelly Bingham lives with her husband Marty and four children in the town of Ellijay, Georgia.